And no, we're not talking about Jeff Sessions. On Wednesday, a giant inflatable chicken styled to look like a certain current president of the United States ruffled a few feathers when it was spotted roosting just outside the White House. 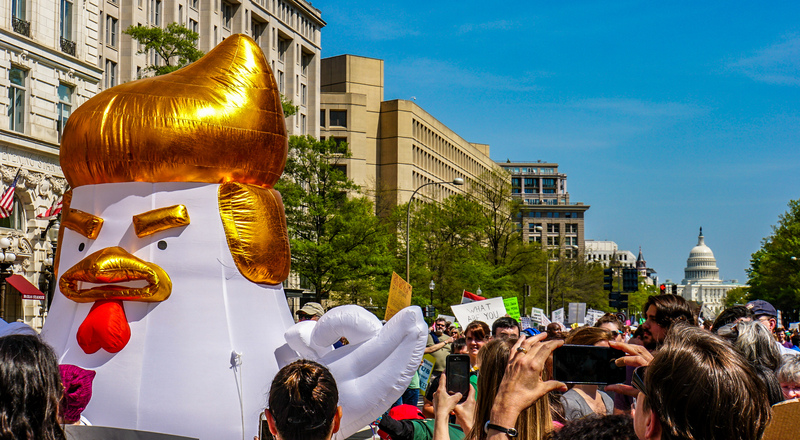 The chicken balloon, owned by filmmaker Taran Singh Brar, sported a shiny golden mane and a grumpy expression, with one wing pointing in an accusatory fashion and two … feathers on the other curled into Donald Trump’s signature “okay” gesture. Though this is not the first time the balloon has reared its head — it marched in at Chicago’s Tax March in April and stood sentinel outside of several pro-Trump events — this time, its proximity to the White House evoked a particularly strong reaction, particularly from the pro-Trump crowd. Some Trump supporters were outraged that anyone would even think to compare Donald Trump to a chicken, especially given his hawkish stances on conflict resolution. Others took jabs at Hillary Clinton, which is something that’s still worth doing, apparently? Because nothing says, “I am not sensitive, and I do not get offended easily!” like lashing out at someone who isn’t even a threat anymore. There, I Fixed The "Trump-like" Chicken. But not everyone seemed to mind the chicken. An editor-at-large for Infowars, for instance, sent a different message. Even Piers Morgan, the guy who everyone totally does not hate and whose opinion definitely matters, had a pertinent quip for the moment. He retweeted a New York Times article about why the chicken was near the White House and made sure to slip his two cents in for good measure. Nice one, Piers! That totally makes sense. Trump was not in the White House to see the balloon. He is still in Bedminster, New Jersey, for his working vacation, which is probably for the best. Had the Trump family been in the White House when it was inflated, Barron might have thought his dad turned into an actual giant chicken.